Yesterday I spent the day running up and down the highways and byways. Among my many accomplishments was a long overdue trip to the grocery store. It was after dark when I got home and I unloaded the bags rather unceremoniously and left everything that would not parish, sitting in the floor. This morning my larder was a disaster. 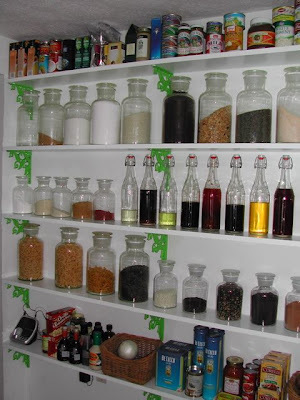 I though of how lovely it was when I first built its shelves and stocked them. After seeing a swatch of Benjamin Moore's Sweet Pea in Domino, I knew I would one day use that color. It took several years, but I finally got a single wall of Sweet Pea. 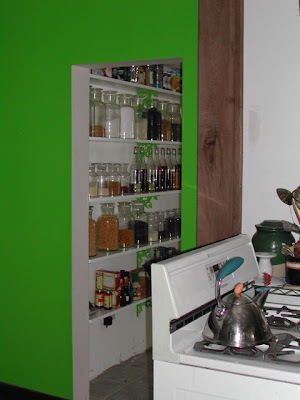 Since you can see the larder from the doorway in the wall, I used the same color for the wrought iron shelf supports. I then began adding supplies. 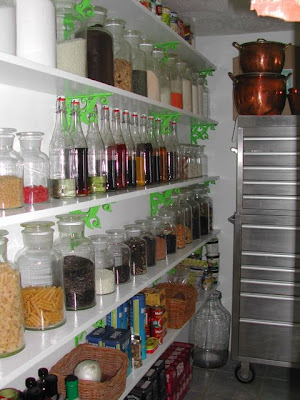 Soon my larder was a vision. This morning it was a nightmare. So I off to bring order from chaos. While I am organizing, you can listen to Lyle Lovett sing about the larder, well he calls it a pantry, but we forgive him. What beauty there is here. 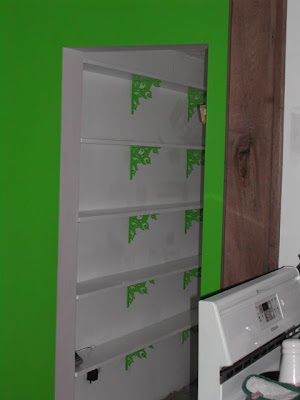 So pleased to see you using rolling tool chests in your kitchen area. I plan to use gladiator workdrawers AS my kitchen cabinets.